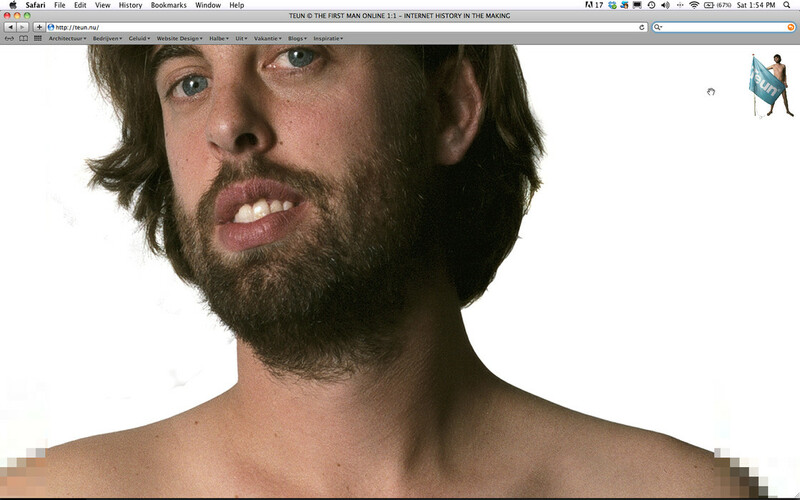 On the website www.teun.nu you will find Teun Castelein on a 1:1 scale. The same size online as offline. A full body portrait, a tradition going back to the very beginnings of human societies. But this one is combined with issues of openness and privacy, in this thoroughly digitalized world. How much do we want to know? How much do we want to share? What does it mean to be transparent, and how do we value it? Looking at this image, what do we do with this information, and what can we do? We see the artist’s body pixel per pixel, life size on our screens. We can scroll over the pores, the hairs, the moles. It makes us feel a little uneasy (and we’re very glad with the flag). Would we ever do the same, or are we already doing something similar? Probably we wouldn’t pose full body on the internet, half naked, life size – but why, actually? What does it say about how we see the body in this age full of screens? Despite all the questions, despite our unease, there is pride in his gaze, looking straight at us like a renaissance portrait. Being the first man online.